The man behind decades of summer programs at Southwest High School and a range of community education opportunties in the Minneapolis Public Schools district is hanging up his hat Oct. 1. Tom Neiman is a community education specialist in southwest part of the Minneapolis. Since he started the Southwest Community Education Program in 1974, he has brought people together in ways that range from swimming programs to senior citizen activities. 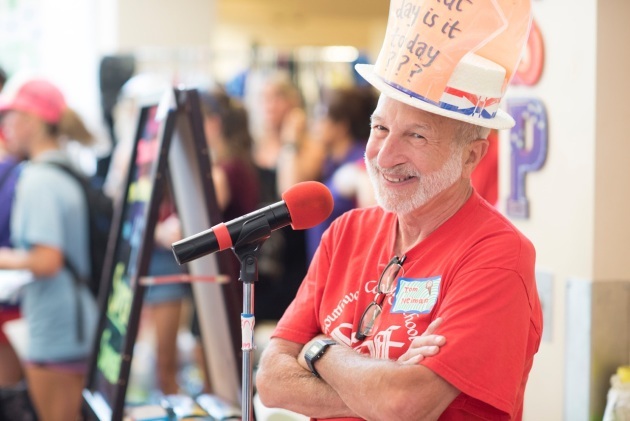 Neiman, 69, devised the Southwest Super Summer Program model in the 1984-1985 school year — one that he said brought in nearly 3,000 total kids this summer. Between 1,300 and 1,400 kids register for classes in each of the six weeks, Neiman said. That includes Minneapolis children, but also fans outside the area who may visit family in the area for the summer and send their kids to the summer program. "I believe strongly in the importance for children to feel valued for who they are," Neiman said. His question to kids and adults alike: Want to try something? "It's important to give people opportunities to do things and, in particular, especially if they've never done it before," Neiman said. "The usual response people would have, or kids, would be, 'Well, I haven't done that before,' and I would say, 'Well, neither did anyone else, until they did it.'" Staples of the summer program include the famous ice cream song that Neiman authored, which students belt on Thursdays before they attack the plethora of ice cream choices, including lactose- and gluten-free options. He said he hopes he can continue to help out with family programming, youth groups and community service projects. In addition to the kids' program, Neiman took a group hiking this year in his 19th biennial Glacier National Park trip. This summer, Southwest Community Education held its 38th annual midnight to dawn bike ride. The list of programming goes on, and includes an environmental organization at Southwest High School called the Green Team. Southwest High School principal Bill Smith called Neiman "a legend in this community" in an email. He continued that the Super Summer Program is often the first time families get to know Southwest. "This is a better place and a stronger community because Tom Neiman shared so much of his life with us," Smith said in the email. The school is toasting to Neiman's career with an ice cream social in his honor. It's on Oct. 1 from 11 a.m. to 1 p.m. at Southwest High School. It's free and open to the public. Photo above: Tom Neiman on the last day of the summer program. Courtesy of Scott Streble.